Cheap is a relative term when it comes to college students. Among the things that can be cheap and expensive, gas prices play a part in their everyday lives. There are three gas stations that are the cheapest, as well as closest to the campus. The cheapest gas station is 7-Eleven located on 8001 NW 23rd Oklahoma City, OK. The regular gas price is $3.29 and is 2.7 miles away from campus. The second closest and cheapest station is Valero (Flash Mart 2), which is located on 5850 NW 39th Expressway in Warr Acres. Its regular gas price is $3.45 and is .8 miles away from campus. The third closest/cheapest gas station closest to campus is OnCue Express with a regular gas price of $3.47. The station has 18 pumps and is open 24hrs. Its location is 7101 NW 39th Expressway. Richardlyn Hilton, freshman Pre-Med major, lives in Oklahoma City and prefers to get her gas there. Due to going home on the weekends and going to work, Hilton has to get gas every week. “I prefer to get gas in Oklahoma City because it is much cheaper,” she said. On a Nationwide scale, many different issues influence the numbers. According to Brad Tuttle of TIME Magazine via, as of January 09, 2013 the national regular gas average price is $3.30. 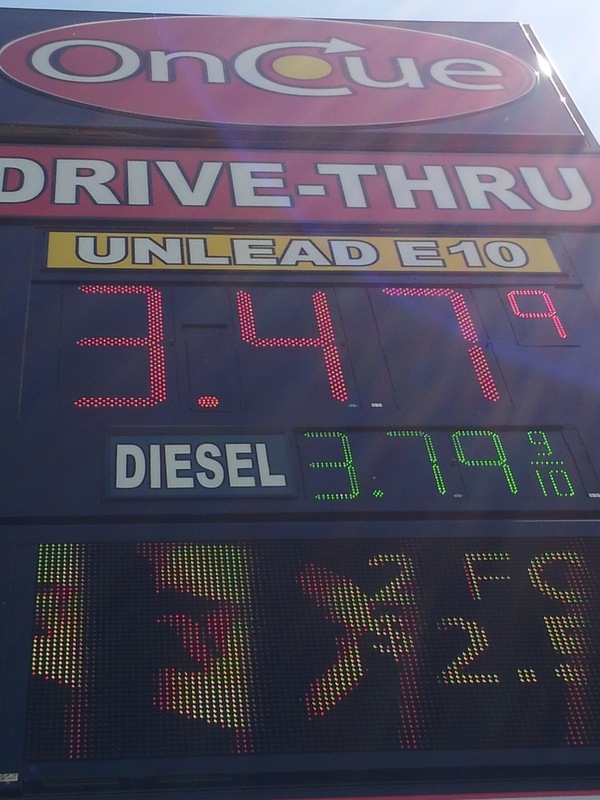 In 2012 gas prices around the country reached the highest point of $4 a gallon of regular gas. At this point, Tuttle says it will repeat the same as last year in the fluctuation of prices. The highest price of gas in the country is in Hawaii with an average price of $4.34, according to Daily Fuel Gauge Report. Hawaii’s gas prices are so high due to shipping costs because of the oil having to be shipped across the ocean. Hawaii is known for having one of the highest excise taxes on gas across the nation of 69 cents a gallon. Compared to the excise tax in Hawaii, Oklahoma has one of the lowest in the country of only 16 cents per gallon according to Oklahoma General Excise Taxes via taxrates.org. The state with the lowest price of gas is Wyoming. The average price of gas is $3.27. There are four operating refineries which are among the fourth highest in the nation. The amount of refineries help lower the gas prices. In April of 2013, Wyoming held the lowest price of gas with $2.84 a gallon. The average gas tax in Wyoming is 32.4 cents per gallon, which is lower than any state except for Alaska. The lower gas prices have made Wyoming the most affordable state in terms of transportation. The type of car can also affect the amount of gas that is used. Some cars require more gas than others to run. With this variable in thought, a key to cheap gas is the kind of car being driven. Next PostSo we get free laptops….